Hey everyone! I'm super excited to let you in on my Fashion's Night Out plans and how you can all be a part of it even if you don't live in New York. I'll be corresponding live from Nine West in partnership with BigLive to bring you all the action as it happens! And if you've attended anything FNO related in NYC then you know things can get real exciting, real fast. You can tune into BigLive on either my blog (post going up Thursday! ), my Facebook page or the Nine West Facebook page. 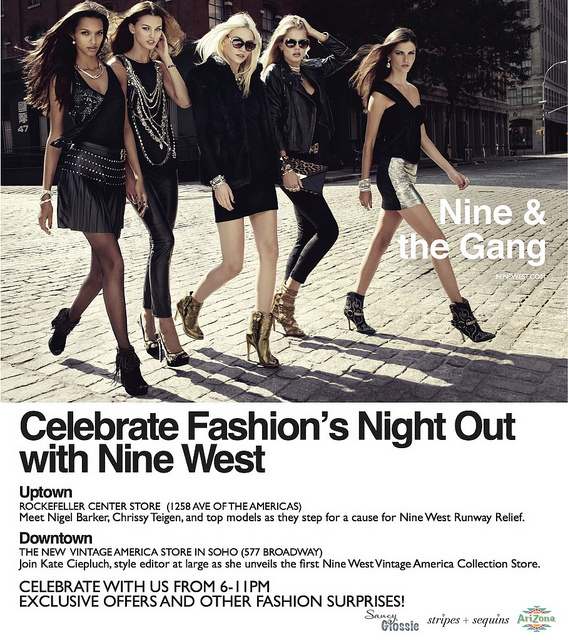 I'll be bringing you all the action from Nine West's brand new Vintage America Collection store in Soho, plus chatting with Nigel Barker (*sizzle*) and more as we celebrate Runway Relief at Nine West Rockefeller. Tune in from 6:30pm and chat with other readers and Facebook fans about everything fashion from shoes, celebs, DIY and more on Thursday September 6! Last but not least, in celebration of the new Vintage America Collection store, Nine West has launched a vintage photo contest with Instagram. Snap your favorite fashion moments on the night of FNO and share them on Instagram with the #nwvintage for the chance to win some amazing prizes. Good luck and hope to see you guys live from FNO! oh and PS: Don't forget to follow my instagram @saucyglossie for behind the scenes pics of fashion week and all of the cray cray things happening this week!